Many people fear that their dogs will choke on a raw bones and that they may splinter. While this is a small possibility, there are greater risks your dog faces every day. Most dogs (larger breeds) inherently understand what to do with a raw bone. I’ve given raw bones to dogs that I’ve rescued and they immediately “got it.” I do err on the side of caution when I first introduce raw bones to new dogs. I will first see if the dog gets overly possessive over the bones. I do this by checking to see if the dog has food aggression with other food first. If they do, there’s a good likelihood that the raw bones will increase this aggression because of the value of the reward. If a guy is possessive over his girlfriend when you talk to her, he’ll probably really flip out if you flirt with her…. If the dog shows severe issues with food it might be worth it to work on the food aggression by hand feeding before introducing raw bones. I do this by holding the bone while the dog chews on it. I also watch how a dog handles eating raw bones, if he is crazy, he might choke. I like to give a dog raw bones under a controlled environment in the beginning. I like to supervise them when they first are introduced, and while I never leave dogs with raw bones when I’m out, I will, once comfortable, allow them to enjoy their bones outside while I do my stuff around the house. If the dog understands the raw bone thing, chances are that he will chew away at the bone and get all of the benefits of the natural treat. There are several different opinions on whether the bone should be raw or cooked. Most all bones you buy at the pet store will be cooked and processed. I feed only raw bones and most often I give these bones frozen. Some people say, and I agree, that cooked bones can splinter and present a great danger to your dog. I’ve fed, and continue to feed, my dog raw bones, raw chicken backs and turkey necks and have never had an issue. When giving dogs raw bones I always try to make sure that the bone is too big to swallow whole. Although most dogs don’t try to swallow whole bones, it is a good idea to make sure that the bone is bigger than your dogs throat…. bigger is always better. Remember that a dog will chew the bone down and eat it, so if the bone becomes too small and the dog is voracious, you might consider taking the smaller bone away. This is most easily done by exchanging the bone for a toy or something else. This teaches the dog the fairness of the exchange. Once they get it, you can easily take the bone away. Certain types of bones are more common to be eaten completely, this includes rib bones, lamb bones and necks and tails. Very thick bones are most likely to be chewed on for longer periods of time. Dogs will try to bury their bones, they do this to help the decomposition process. So it’s not uncommon for a dog to bury their bones and dig them up a week or two later and eat them. Another common objection is that raw bones can make a dog sick. There are several studies and reputable sources that will dismiss this concern, among them Dr. Jean Dodds. 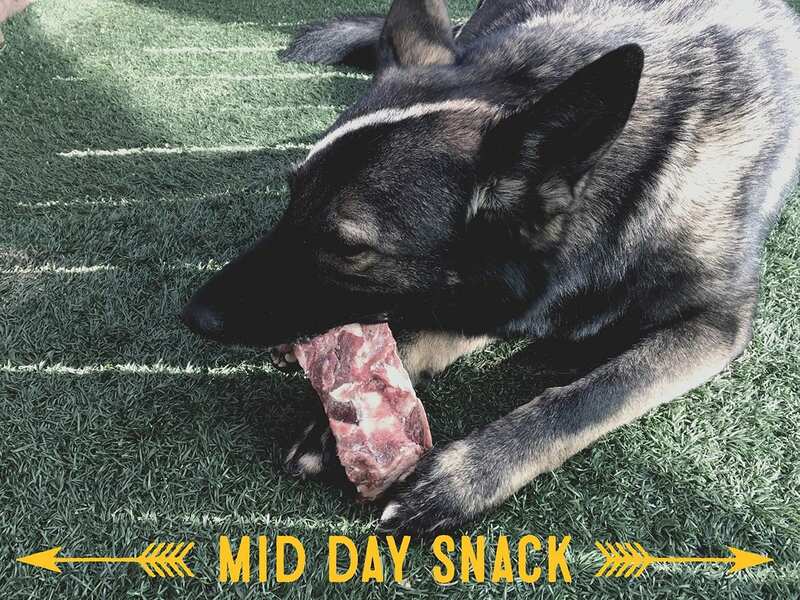 While humans can get sick from raw meats, it’s highly unlikely that a dog will get sick from eating a raw bone or raw meat. To be safe I freeze all of my meats for several days or longer before giving it to my dog. It has been proven that freezing meats can kill anything that might cause harm. ***If you have concerns, check with your vet, and if they are against raw feeding and only suggest kibble, you might seek out another vet. Holistic vets and Integrative vets (vets who believe in natural treatments as well as Western Medicine) will often give you a more balanced answer.